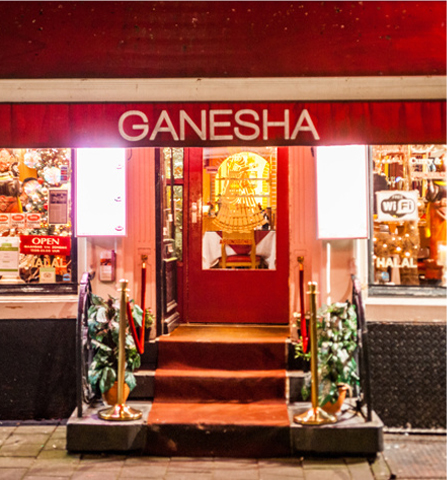 The Ganesha restaurant is in the heart of Amsterdam, close to the Central station. A perfect base for a day to end with Indian traditional dinner or you can continue your journey to nightlife in Amsterdam. The dishes are traditionally prepared. Also for people who have no experience with Indian food, it is definitely recommended to visit this restaurant. Do not be afraid of hot dishes. Our cook has thirty years experience and will cook according to your taste. It is a delicious experience, you should definitely try it. Not only for beginners but also a culinary experience for people who appreciate Indian cuisine. The NAAN, a traditional Indian bread, is also prepared in the clay oven at the same time , so it is always delicious, as it should be. Get 10% Extra Discount By Making Your Reservation For More Than 25 People. This discount will be valid for lunch only. Download your free discount voucher here. With this voucher you get a 10% discount on the bill in our restaurant. This voucher is valid only between 12:00 – 18:00 hrs and only for maximum 4 people. This promotion is only valid if you report this in advance, and not in combination with other promotions. To be able to download this voucher, you must enter your name and e-mail address. You will receive a link per e-mail to download your personal voucher. We went there on our last night in Amsterdam. We found it by accident (it was near the hotel). It was a Sunday, few people were dining, but the staff was very friendly and gave suggestions. An older gentleman, we think he may have been the owner, was very helpful in menu selections and for questions about the food. We are continually striving to provide high quality services to every one of our customers. Do give your feedback so we can provide you best service.